One of the best measures of a bull market has to do with how many of the S&P 500 stocks are advancing, compared with how may are lagging. In a healthy bull market, the overall positive return of the index is a result of the fact that most of the component companies are advancing and appreciating. The most deceiving periods are those in which the S&P 500 is gaining traction, overall, attracting momentum traders, but under the hood, reality tells a different story. This is precisely what is occurring in the 1st half of 2018. These ten tech stocks have combined for 122% of the S&P 500’s return this year. In other words, take these businesses away from the equation and U.S. equities are not in an uptrend anymore. 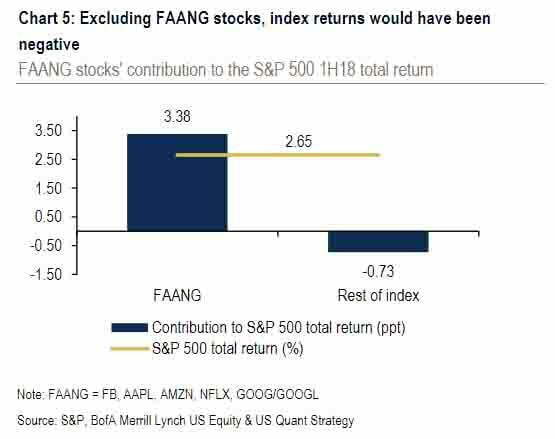 This is extremely dangerous, for it means that fund managers are either (1) concentrating on these stocks heavily to deliver high returns to their clients, or (2) they hold the S&P 500, instead of cash, since they see the index advancing, but it is a mirage – an illusion. Both of these options, though, regardless of which represents today’s set-up more accurately, calls for only one end result: FLASH SELL-OFF. 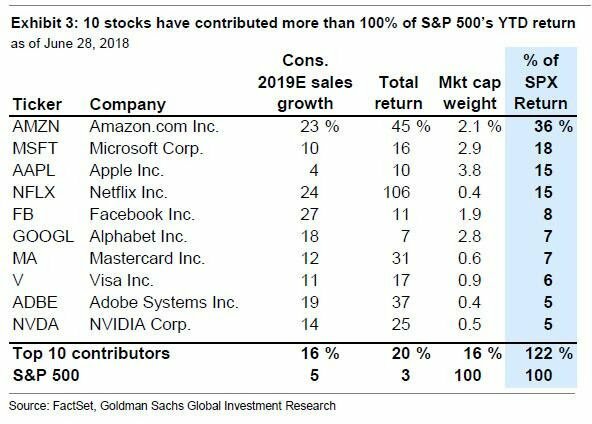 These ten companies are responsible for the fact that investors are making money right now, instead of liquidating S&P 500 holdings. With higher interest rates and with negative appreciation potential for these stocks, which are overvalued, the risk of a mass exodus out of them exists, persists and constantly over-hangs above our heads. Apple, for example, has only an 8.1% projected annual return over the next 5 years, using our proprietary research. Microsoft will likely return a mere 8.5%. NVIDIA, which has exploded higher, thanks to blockchain and cryptocurrency, will deliver low returns of 7.0%, according to our software. In other words, many of these top 10 winners will not be market leaders in the coming years. Investors have made a fortune with them. In fact, Microsoft, which I invested in right after the crash of 2008, has more than tripled already, for instance. Far too many investors are betting on far too few companies and this soup smells bad. There has never been a bull market, which lasts long, when 5 stocks defy gravity and compensate for the other 495 stocks. Investors diversify out of these tech giants and into the cheaper sectors, causing a renewed rally. Investors pay the price of holding live grenades. Since over 35 companies in the S&P 500 could deliver 10%+ returns over the next five years, Wealth Research Group sees investors diversifying soon, leading to a final market rally in this long cycle. Diversification is the name of the game right now – don’t make overly-concentrated bets. This market could go both ways and it won’t take much.